I hope you've all had a nice week and a lovely weekend! Things have slowed down a bit here. I didn't make ANY cheese this week - GASP! Actually as I type this, I have some curd cheese ripening for tonight's poutine! :) I ordered a bunch of new cultures to make new cheeses, I can't wait to try them out! My next attempt will probably be a Camembert! I can't wait! But I wanted to show you my cheese cave...aka the old bar fridge. I have SEVEN cheeses aging!! How exciting! 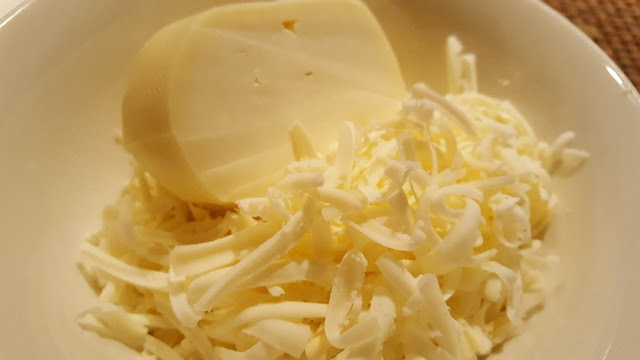 (I posted a more detailed update on Rainy Day Cheese Making). I did have eight cheeses aging, but we decided to try the Mozzarella on Pizza Night! 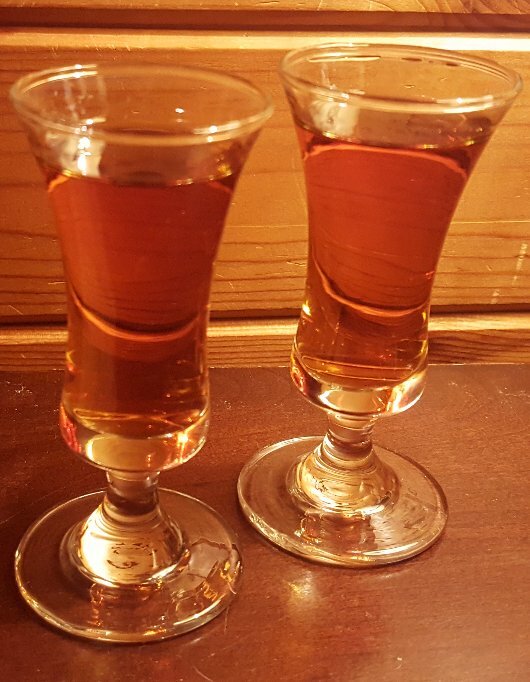 My little aging experiment really turned out well. I aged this Mozza just for a week but it really changed the texture into a cheese that was easily grate-able. It melted perfectly on the pizza and tasted wonderful! 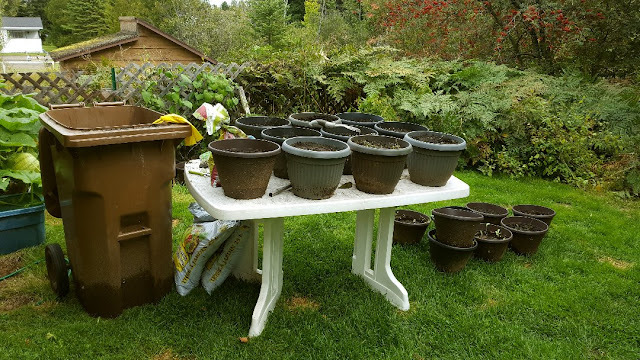 Garden Update: I spent a few days in the garden this last week. 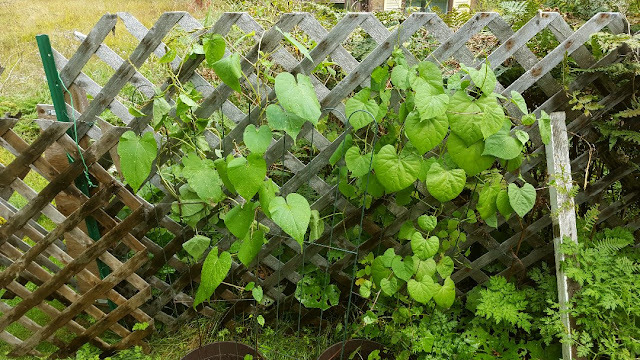 I had to move my Morning Glories...they just haven't even bloomed yet, oh well. The tops look healthy but the bottom of the plant is very dry and brittle. Not sure what happened there but I do hope I get some flowers before winter! 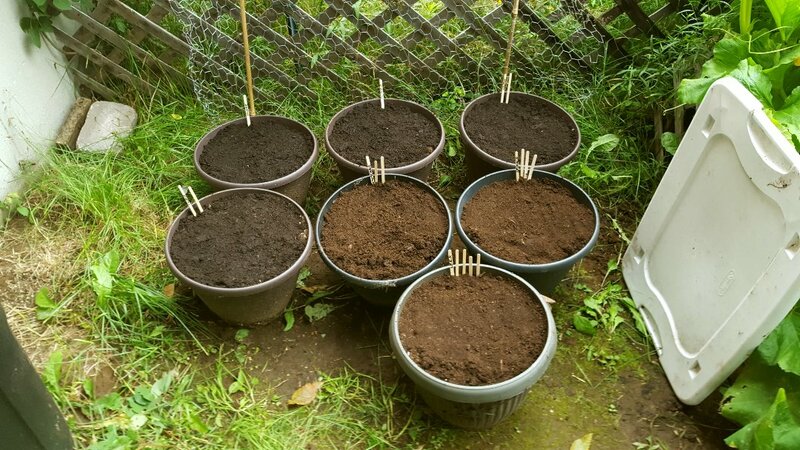 One of my projects for the year is to plant a winter garden. I'd been doing lots of reading up on what crops can handle cold climates. So I got to work on a very muggy but warm afternoon! The two spots I have planned for the winter garden are on either side of the porch. These are the best areas because they are protected from the North wind plus they are on the South side of the house so they should get lots of sunshine and warmth! 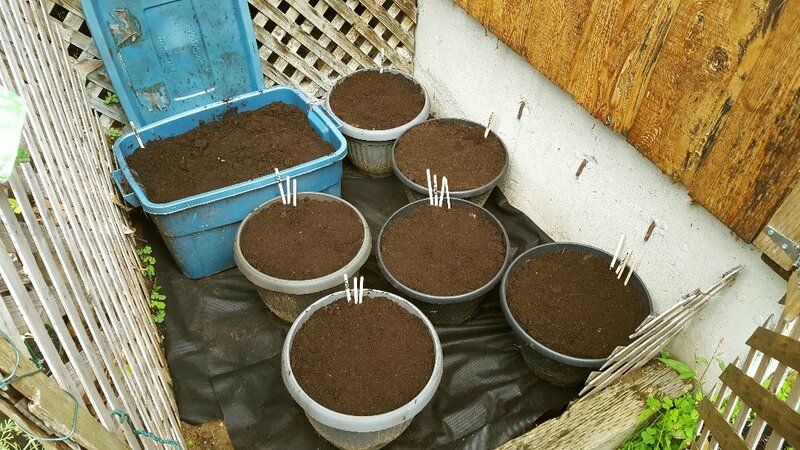 I planted carrots, Brussels sprouts, beets, turnips and green onions on one side. 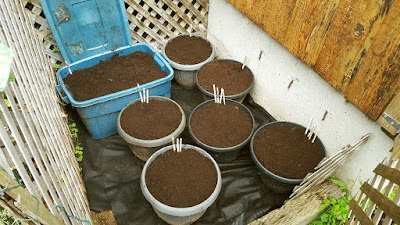 Then I planted Miners Lettuce, Corn Salad (Mâche), Leeks, Mustard Greens and Spinach on the other side. 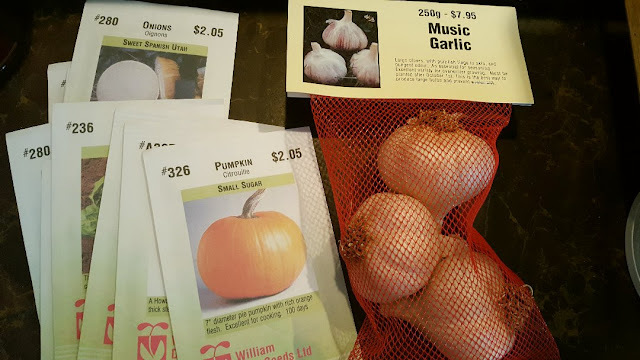 This is yet another first for me, so I'm hoping with lots of mothering, my winter garden will give me some freshness throughout our cold snowy winter. They are currently protected each night under poly-tarp until I can manage to build two cold frames. I didn't plant too much since it's my first winter garden. If things work out, I'll plant more next year. 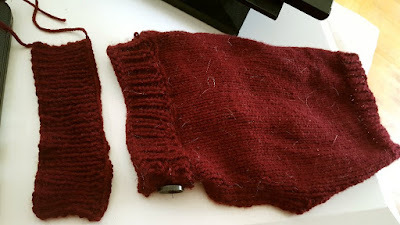 Knitting Knews: :) I had to make an extension to the neck band for Jack's sweater. It started to stretch a little and fall down to his shoulders. I'm hoping this will keep it all up and comfy for him! 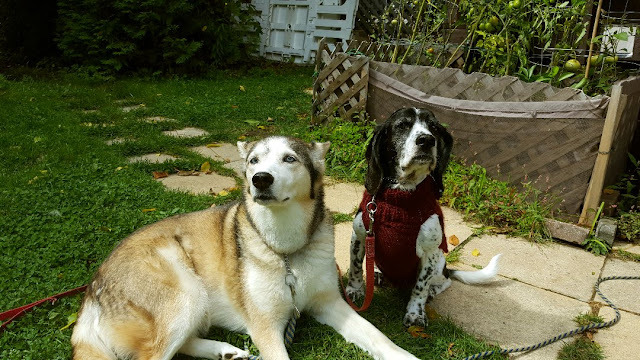 Enjoying the fall weather with his "twin" Marlene - joined at the hip! 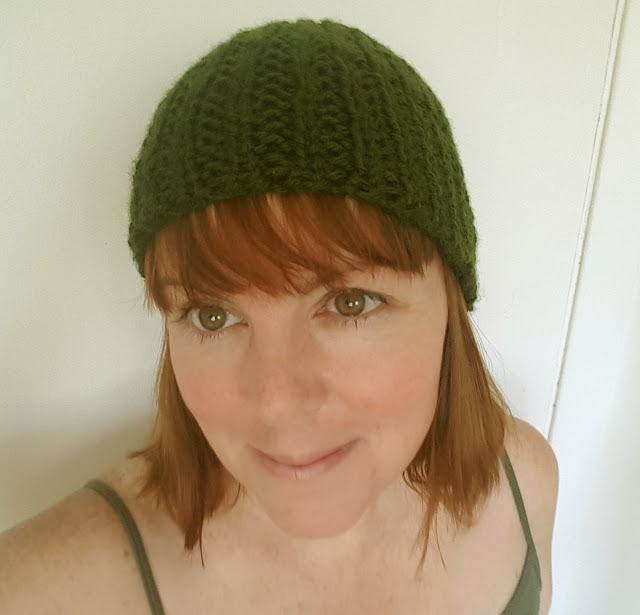 Here is another non-planned knitting project: I finished the "Man Hat" as suggested by Farmgirl Sam, who is a great inspiration to me! It's a nice pattern, very easy! I'm going to knit another one for myself because it's just a wee bit loose on me. I know I'll get a slap on the wrist for this, but I NEVER check my gauge (and you can't make me! )...but it does make for adjustments and sizing surprises now and then! Still, I'm really proud of myself, despite the double-pointed-needle-stress at the end lol! I'm very happy I joined the Ravelry group. It's really got me knitting again! Bargain Hunting!!! Alex and I spent last Thursday hitting the thrift stores, what a haul we got! I've always wanted a Raclette machine, but they are a bit expensive. We got this one for $6 and we tested it, it works! I can't wait to melt some cheese on stuff...lol...another way to add melted cheese to my life, go figure. I also scored on cookbooks. It's not easy to find English books in this area, but I guess some Anglophone was generous lately with the thrift stores and I snatched them all up! 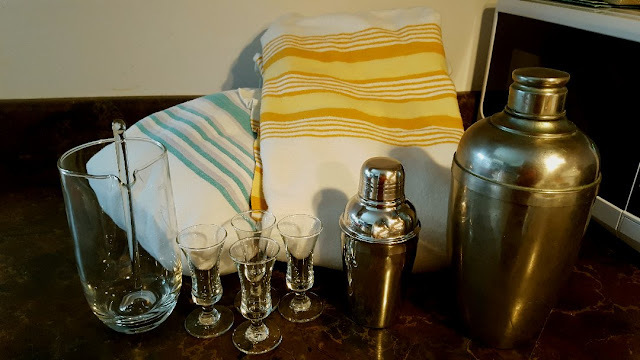 We got a duo of blankets and barware too. And we only spent a total of $27 so it was a nice treat! I so enjoy your cheese making adventure. It's just so sad I can't taste some of them, they look so yummy! Well done on the knitting front as well, and congrats on your bargains. You had me at 'poutine'. lol. You are a wiz with that cheese cave. I dont know what that machine was you found for six bucks so I am off to google! I love thrift stores, great finds. Your cheese looks so good and I'm sure you will enjoy your winter garden. I need to remember to eat before I visit your blog. It always makes me so hungry LOL. Your cheese cave is a great way to reuse and recycle. You have really gotten into the gardening and I am glad to see there will be a winter garden for me to watch and envy too. I think that hat looks wonderful on you and just so you don't feel bad...............I don't swatch either. So far I have been lucky though. Your fur babies are so cute. Jack looks so proud of his newly improved sweater. Nice on all fronts. Don't know how you find time to blog with all the projects at hand. I don't swatch either. But if the yarn is expensive enough and I want to know the project will not be a surprise of the wrong kind I do. Just call me chicken but I don't like putting a lot of work and time into something only to find opps, lol. 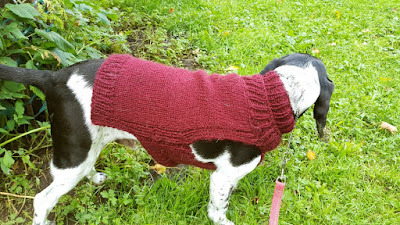 Jack looks very handsome in his sweater/coat.. looks like the neckline mod worked out perfectly! The Man Hat looks great on you... it matches your top. I'll be interested to see how your winter garden does. I've been reading up about cold frames and hooped wraps for raised beds, but all my plans will have to wait until the insulation and winterizing is done. Maybe next year? You scored big! Walking through thrift shops is always fun. You never know what you'll run across. I'm so curious about your winter garden. I'm looking forward to your results! I did zero gardening this year and it shows. Our landscaping, aside from keeping the grass neatly cut is a mess. But I couldn't stand the thought of adding outdoor work to all the indoor renovations. But we're almost done with all that. 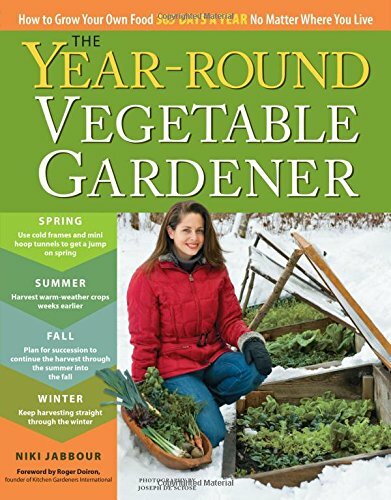 Over the winter, I will plan and design my flower beds and the areas I want to grow fruits and vegetables. And come spring...BOOM...we're going to get outside and shake things up! Very interesting about aging the mozzarella. Mine is a "quick" version so no aging. But I grate and freeze the extra for when we don't have milk. You've really been gung-ho with your cheese making! Fun, isn't it? I can't wait to see more about your winter garden. Good post Rain! You're definitely a looker as well. Your cheese looks great. I wouldn't have the space to keep a year, ha ha! I still hope we can dig a root cellar, but who knows. Nice thrift scores. Glad you have the space to store it all. Wow, Rain, you look like a model right out of a glossy fashion magazine in that picture! I totally agree with Treey above . . . you're definitely a looker! What a haul thrifting! I love thrifting! Those blankets are warm...we have a few here. I am with Mama Pea....icicles are a specialty here in Manitoba! I am right there with you on checking the gauge on anything knitted - NOT doing it! Your cheeses look fabulous! 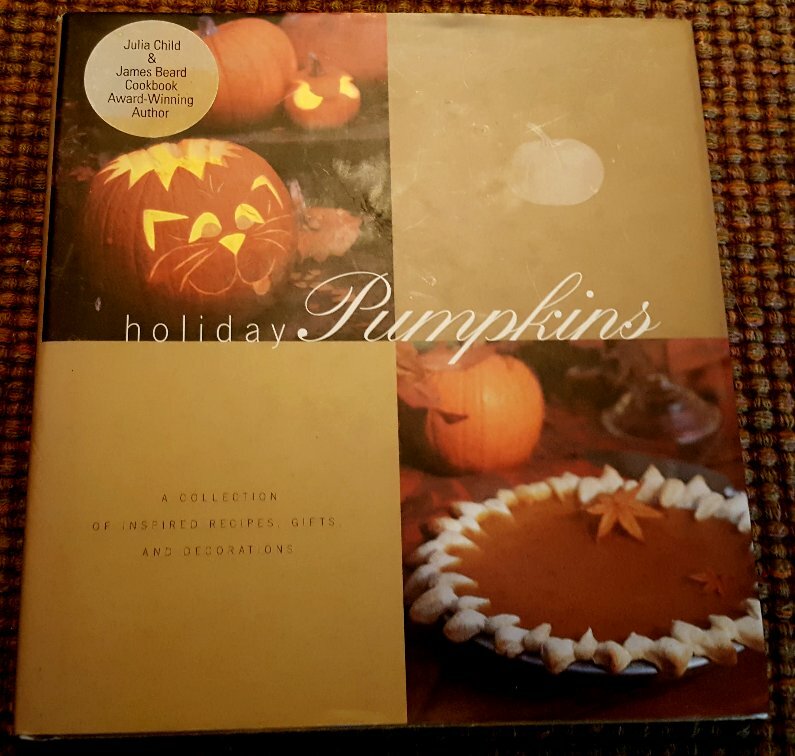 And what a score at the thrift! The grated mozza looked perfect! Also I had to look up what a raclette is...lol! Looks interesting! Love the 'man hat'. I had a friend knit me a hat last year with a pony tail hole in the top and I just love it!! i have major cheese making envy! they all look terrific. and what a great buy in a raclette machine. i have a couple of them....we love raclette! you can make nachos in them too! Hi Mary-Anne :) Lol...wait until you see the poutine I come up with...I'll post a photo in a few days, it was drool-worthy! :) The raclette machine is wonderful. You just fill the trays with meat, veggies or whatever and put "raclette" cheese slices on top to melt it. Just another way of having a cheese fondue type of dish! I've wanted one forever and I can't believe we found one! Hi Christine :) I do hope we have a winter garden to enjoy. The book I read was written by a lady in Nova Scotia...they have milder winters than here in the Laurentians, but I'm giving it a go! Hi Jenn :) Oh thank you :)) I only noticed after that my eyes looked REALLY green in that photo! My next hat colour will be red, wonder what colour my eyes will be lol? Honestly? If I only count cost of milk and bacteria...YES, the expense is much less than what I would buy at a QUALITY cheese shop. Obvious you can't beat when Cracker Barrel is on sale for $4.99 at the grocery store...but then, what exactly are you eating right? 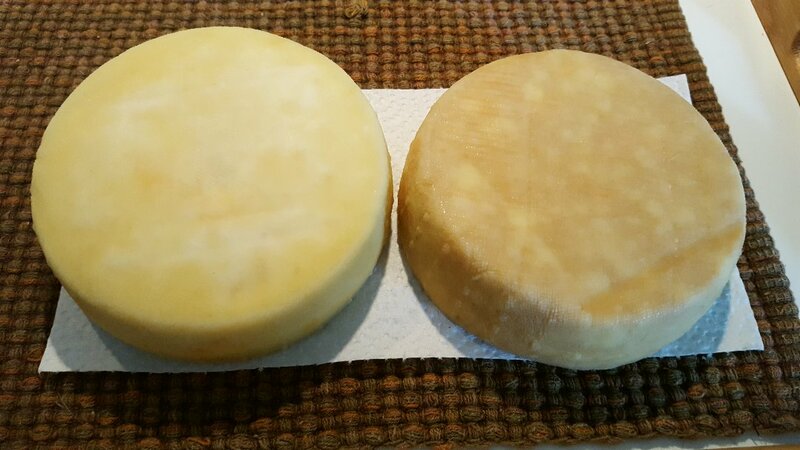 Last week we were so much into wanting to try one of the Cheddars that we ended up buying Balderson's Cheddar. It's an Ontario cheese and really delicious at $9.50 for 500g. I have to weigh it to be sure, but my Cheddars are at least double that amount, and the cost would be the same. If I add up all the equipment, then we're talking a different ball game, but over time (since I NEVER plan to give this up! )...the cost will definitely outweigh the store bought stuff! Hi Goatldi :) I think once I graduate to more expensive yarns, I might be convinced to swatch too lol...but I kind of always know my gauge is okay. So far it hasn't been too much off! Hi Lynn :) I'm really happy with the neckline modification I made for Jack and he absolutely loves his sweater! I have to think of another one for him. Thanks, I really like how easy the hat was to knit too, though I'm not a big fan of the seed stitch - only because I need to focus too much and with all the pets, I get easily distracted! I wasn't able to even think of a winter garden until this year because our money was dedicated elsewhere. I have a wee bit of wiggle room this year and lucky enough to have two spots that will be safe from the wind and in the sun all day long. I thought about hoop houses but I don't think that would be strong enough...we get a lot of snow and wind. It's going to be a daily thing to check on the garden, shovel snow, open up the cold frame on really hot days etc...but I do suffer cabin fever and S.A.D. so I thought it might be a really good motivator to get me out of the house every day too! Stay tuned, I'll keep everyone posted! I think your climate might work well for a winter garden too. , she's from Nova Scotia so I figured she knows the Canadian climate. I hope it works!! Hi Leigh :) I have definitely been gung ho and I do love it! :) It really is fun. The Mozza recipe is the "traditional" one and the author Gianaclis Caldwell (love her!) ages hers so I gave it a go and happily it worked! I think you're right that something should always be growing! I'll have my window sill "garden" going too! Hi RO :) Oh thank you! You're so sweet :)) I think the cheese will be gifts only for us at this point! ;) I really can't wait to try them out, but I have to make sure they age enough or we'll never have that flavour we are hoping for, it's hard to wait though! 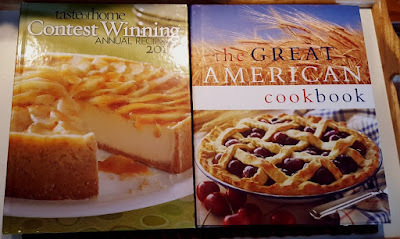 I remember you mentioning that you collect cookbooks! 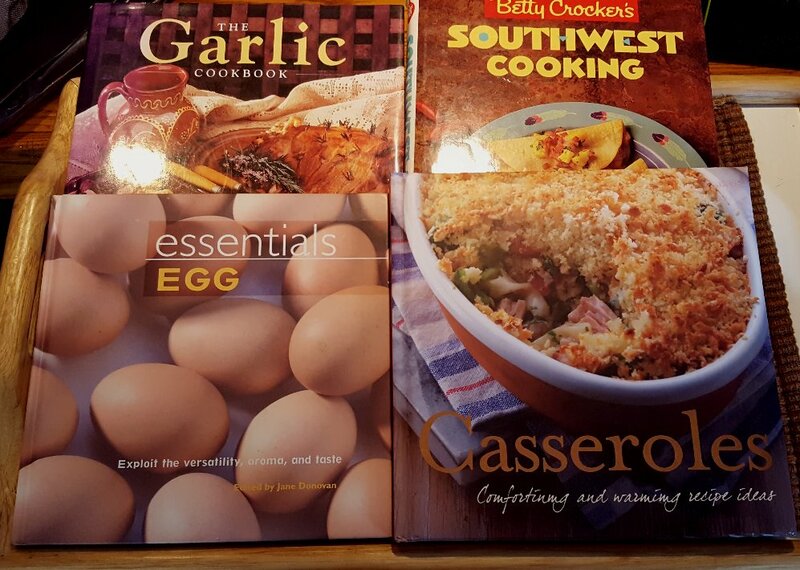 The ones I got are all pretty good with some nice recipes! Hi Kristina :) I had to find the space for the cheese...I was even willing to buy a used fridge for that job! We're lucky we have a basement here in the rental so it's all being used pretty much as storage for everything. I will have to admit, I had to google "raclette machine". I had no idea. And now........I WANT ONE! Ha. And I'll be right along there with Octoberfarm......CHEESE. ENVY. I'm SO going to have to dip my feet into cheesemaking (wait, that sounds gross, ha) dip my FINGERS into it. You are inspiring!!! Keep it up! Hi Becki :)) Thanks! I really have high hopes for the winter garden. Though I had high hopes for my summer garden too and I'd say it was 60% successful! But the good thing is that I'm learning a lot for when we move and have more land for a big garden. I'd never heard of the Yum game either! 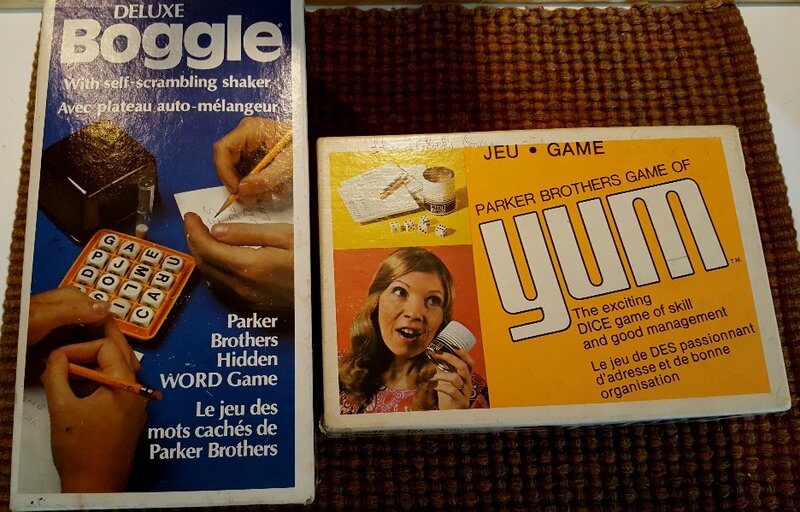 But it was right next to Boggle, so we figured for fifty cents, why not? It's another one of those word games, we haven't played yet. We will definitely be going back to that big thrift store! Hi Pam :) Lol...I talk to the dogs and cats constantly! Alex and I really do love recluse life, but I think that when you become too much of a recluse, it's hard to readjust when you have to be around other people, at least that's how I feel it is for us. But we can't really avoid others all the time, so we just kind of go with the flow when we can! 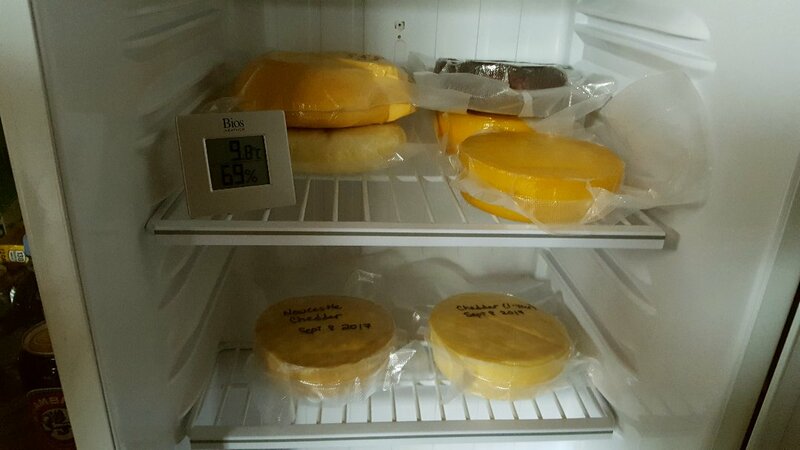 The cheese making has been such a wonderful hobby/project. I only started in July and I have no plans to ever stop! I'm hoping to never have to buy cheese again at one point! Hi Nancy :) Have you ever thought of a few containers for a winter garden? Or does Coco like frozen treats too lol? At one point down the line I would love to have a big greenhouse so I can plant more things in the winter, but I'll start with this! I hope it works out! Hi 1st Man :)) Ha ha ha...I'm realizing that the raclette isn't as known a machine as I thought. Maybe here in Quebec it's more popular because of the "cheese culture"...cheese is a huge part of our diet! At least mine! :) I'm going to challenge myself to make a raclette-style-Swiss cheese soon. 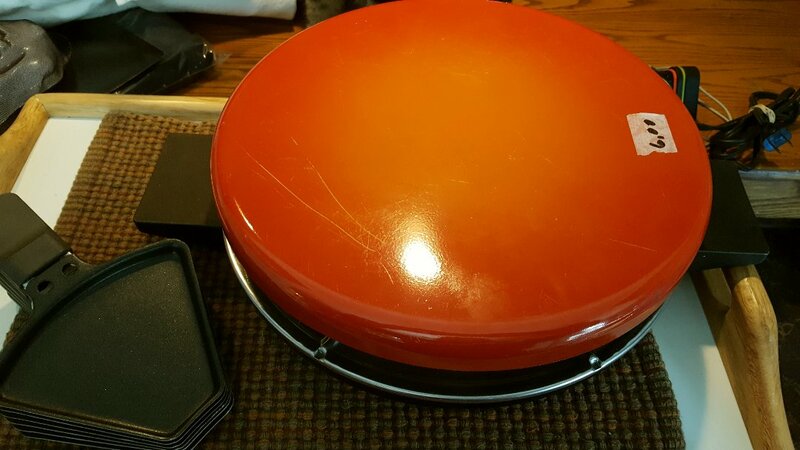 I just remember going to my grandma's and having raclette, but she had the nice big machine that you could warm your food on top of while the cheese melted underneath. ha ha, dip those feet into the cheese hee hee! I think dog sweaters are cute and practical. Your cheeses look good. I admire your skills. Best of luck for your new cheese resolution dear Rain! 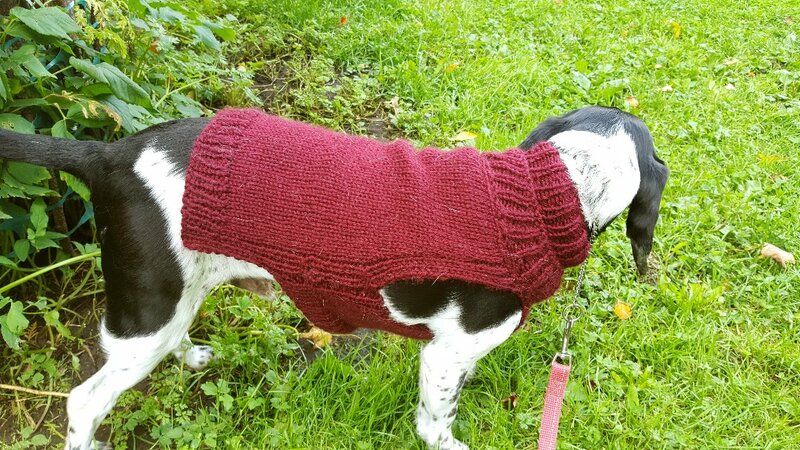 jack looks irresistibly adorable in your sweater ,extension made sweater prettier . i really am amazed with your knowledge for plants observation too as though hubby is but i am not as expert to detect some defect in plant growth . i am sure you will get some flowers before winter my friend! what clever choice of place for winter garden ,it will grow safe and look beautiful for sure . How alike! either i never been much among people ,feel always uncomfortable if i had too. You are such an inspiration to ME!!!! You are so beautiful too and not a wrinkle in sight....how did you do that? LOL! Your cheese cave and winter gardening is what I aim to do....if I live that long! LOL! Your knitting is exquisite...you are a pro when it comes to knitting and look at Jack's sweater....LOVE!!!! And your girls and boys are part of my family now too....I love them. Jack has definitely stolen my heart. Lol..the power of the selfie! Actually Alex and I noticed that on the newer Android phone cameras, the selfies have some kind of "wash" on them that (for lack of a better word) cleans up the image. I have wrinkles! :) But I was blessed with young-looking skin so I'm happy! Raclette, I think it's French or Swiss...you basically melt cheese on those little trays. There is a heater under the top. Then you pour the melted cheese over your meat, potatoes, veggies etc...some of those machines are really fancy and they have a grill on top too. I'm so glad we found one used! Oh boy I'm craving cheese right now. Hi Stefanie :)) Nice to see you back! I crave cheese constantly lol!